Design Features of the 2019 Ford Taurus | Appel Ford Inc. If you need a stylish full-sized sedan to drive around Brenham, let Appel Ford Inc. show you the newly designed 2019 Ford Taurus. The dynamic exterior will be sure to make a statement wherever you go, and you'll love the sleek lines. 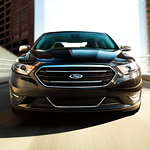 The Ford Taurus comes with HID headlamps that are smoothly incorporated with the body of the vehicle. For added safety, they'll turn on automatically whenever they detect low-light conditions or when you turn your windshield wipers on. In the rear, LED taillamps will make sure that you're seen by traffic behind you. Not only are they brighter than traditional headlamps, but they also use less energy. To allow you to customize the Ford Taurus to suit your needs, it can come with a variety of wheel options. You can choose anything from 18-inch Sparkle Silver aluminum wheels to 20-inch ebony ones.